This is Selmia the Sky Dragon. She spends most of her time laying on the fluffy clouds listening to the angels sing. The sun above the clouds has turned her once white scales beautifully translucent and has burnished her wings gold. When feeling energetic she races the angels through the clouds creating striking patterns for us humans to see. Wearing Selmia will help you be true to yourself and set you on your path to enlightenment. 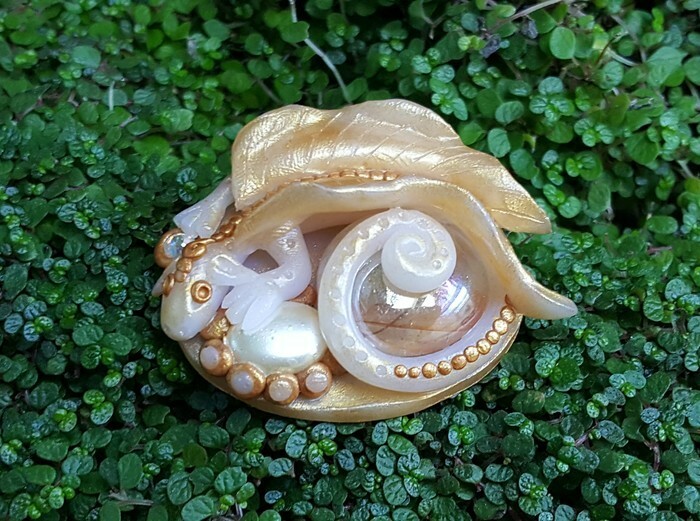 Beautifully detailed and made out of translucent polymer clay with a feature glass pearl, amber glass stone and swarovski crystal this Dragon brooch was a pleasure to make is one of my favorite designs.